"Preferred stocks are about the only relatively safe income producing option and CDx3 is the best information provider." - from George W, CDx3 Notification Service subscriber, December 11, 2014. See more preferred stock investor reviews here. The ten highest quality preferred stocks that are selling for a sub-$25 market price are offering income investors an average 7.0 percent Yield-To-Call in today's preferred stock marketplace. There were a total of 898 preferred stocks and ETDs trading on U.S. stock exchanges as last month came to a close. Of these 898, these are the top ten highest quality issues that are trading below their $25 par value. This list is sorted by dividend rate (coupon) with the highest payers listed first. 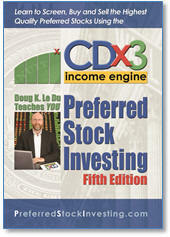 Please consider becoming a subscriber to our CDx3 Notification Service today. An increase in interest rates has been two weeks away for the last two years. Tapering out of their Quantitative Easing program did not produce the rate increase that the Fed had hoped for and so far the Fed’s use of their overnight reverse repurchase agreements has not pushed up the federal funds rate either (see “Preferred Stock Buyers - Be Sure You're Watching The Right Indicator”, September 22, 2014). Dramatically falling oil prices throughout the fourth quarter of last year have reduced inflation pressure, delaying, once again, any hope of a rate increase. On December 18, 2014 Fed chair Janet Yellen stated that the Fed “…could continue to be patient,” a comment that produced a 400+ point uptick of the DJIA. Low rates have decimated savers, with bank CDs hovering around 1 percent. And after years of Quantitative Easing, soft loan demand and new reserve obligations, banks now have a whopping $3 trillion in excess reserves beyond today's regulatory requirements. Capital One even floated a proposal last year to start charging for deposits. In short, banks do not want your money. For preferred stock investors, downward pressure on rates means upward pressure on prices. The average price of the highest quality preferred stocks (cumulative dividends, investment grade ratings, etc.) closed 2014 at $25.98, about a dollar above these securities’ $25 par value, producing an average current yield of 6.61 percent on December 31. The par value of a preferred stock ($25 per share in most cases, and in all cases used here) is the amount that shareholders will receive if the issuing company redeems (buys back from you) your shares, regardless of today’s market price and regardless of your original purchase price. It is for this reason that many preferred stock investors seek to purchase their shares for a market price below $25. Doing so adds a layer of principal protection to your investment since you will realize a capital gain in the event of a future call, on top of the great dividend income that you earn in the meantime. 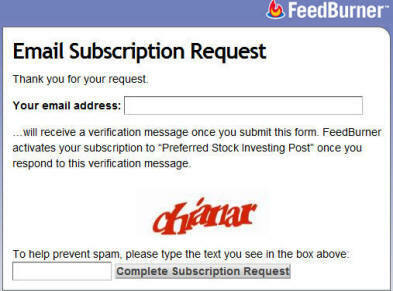 As I have written to you many times over the years (see “Preferred Stock Buyers: Time To Change Tactics For Sub-$25 Purchases”, July 14, 2014), during periods of upward pressure on prices, such as what we have seen for some time and are likely to continue seeing for several more months, savvy preferred stock investors, armed with a web browser and an online trading account, can frequently purchase shares at wholesale (sub-$25) prices when new preferred stock issues are being distributed to the market. 83 percent of the non-convertible preferred stocks issued during 2014 (54 of 65) were introduced to the market by their underwriters using a temporary trading symbol on the wholesale Over-The-Counter (OTC) stock exchange. Subscribers to our CDx3 Notification Service receive an email alert that includes the temporary OTC trading symbol whenever a new preferred stock begins trading on the wholesale OTC exchange. The reason that underwriters use the OTC to distribute new preferred stocks shares to the market is speed. They are out a bunch of cash and they want to get it back as quickly as possible; they are not going to wait days or weeks for the NYSE or other retail exchange to get around to assigning the permanent trading symbol. Depending on a variety of factors, underwriters typically pay about $24.25 per share to the issuing company in exchange for the newly minted preferred stock shares. For example, the underwriters of JP Morgan’s JPM-B, issued on January 27, 2014 offering a 6.7 percent dividend, paid $24.21 (see JPM-B prospectus, page 1). The underwriters, now out the cash ($823 million in the case of JPM-B), are very anxious to sell the new shares to dealer/brokers and use the OTC exchange for these trades. A temporary OTC trading symbol is set up for these wholesale orders (JMXXL in the case of JPM-B). Dealer/brokers typically pay $24.50 to $24.75 per share and are just as anxious to sell the new shares quickly. Turnaround speed is what is important here. In the case of JMXXL, the OTC opening price was $24.75. Savvy preferred stock investors with an online trading account were able to purchase JMXXL shares for less than $25 per share until JMXXL was transferred to the NYSE retail exchange on February 7, 2014 as JPM-B. These are shares of the very same preferred stock that today’s retail buyers are paying $26.42 per share for (December 31, 2014). 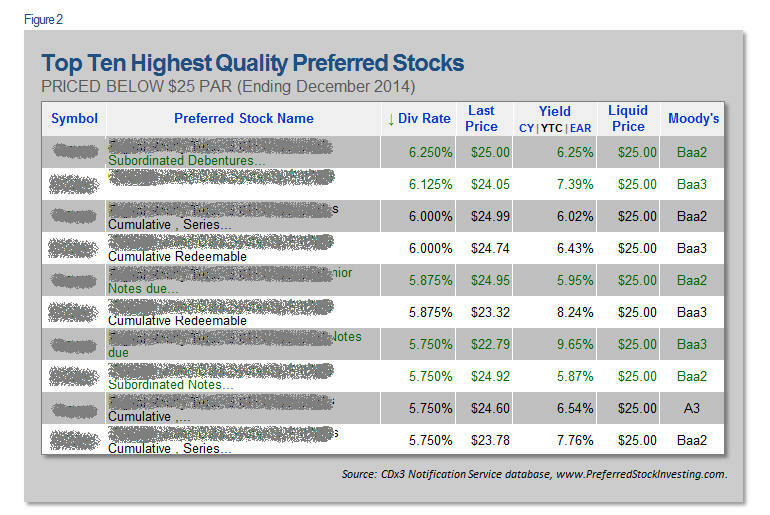 So how did buying shares during OTC distribution work out for preferred stock buyers during 2014? The black diamonds on this chart show the average OTC opening price for preferred stocks introduced during the indicated month. The gray diamonds indicate today’s (December 31, 2014) average market price for the same securities. Notice that in all cases, the black diamond (average OTC open price) is lower than the gray diamond (average price today). To isolate the price behavior of OTC purchases from geopolitical events, 13 preferred stocks issued by domestic upstream oil producers and Greek shipping companies have been excluded from this analysis (see note at the bottom of the graphic). The table below the chart presents the data. Looking at January, there were two new preferred stocks introduced that were distributed to the market using the OTC. The average opening price on the OTC when these two securities began trading was $24.73 per share. Because prices increased throughout 2014, the current average market price of those same two securities is $26.04, providing an average gain of $1.31 per share to those who purchased their shares last January when these preferreds were introduced on the OTC. In other words, the future market price of these January issues would have to drop more than $1.31 per share before preferred stock investors who purchased their shares using the wholesale OTC exchange would start to lose principal. That gives those inclined to sell time to act in the event of a future price drop. 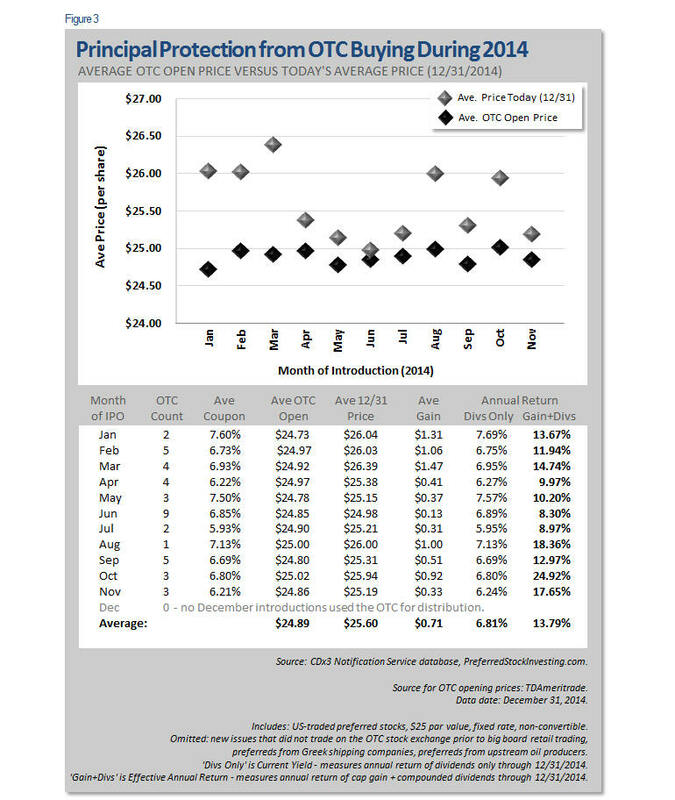 Look at the average OTC open price column and compare those values to the average December 31 prices for the same preferred stocks. The overall average OTC open price during 2014 was $24.89 while the overall current market price is $25.60 per share. And don’t forget about the dividends. The two January issues, purchased for an average price of $24.73 per share, offer an average coupon of 7.6 percent and have paid dividends each quarter throughout 2014. Looking at the far-right column, the average effective annual return on December 31, 2014, when considering the gain and dividends from these two preferred stocks, was 13.67 percent. During a period of high prices, most of your preferred stock positions will be showing significant, but unrealized, capital gains. 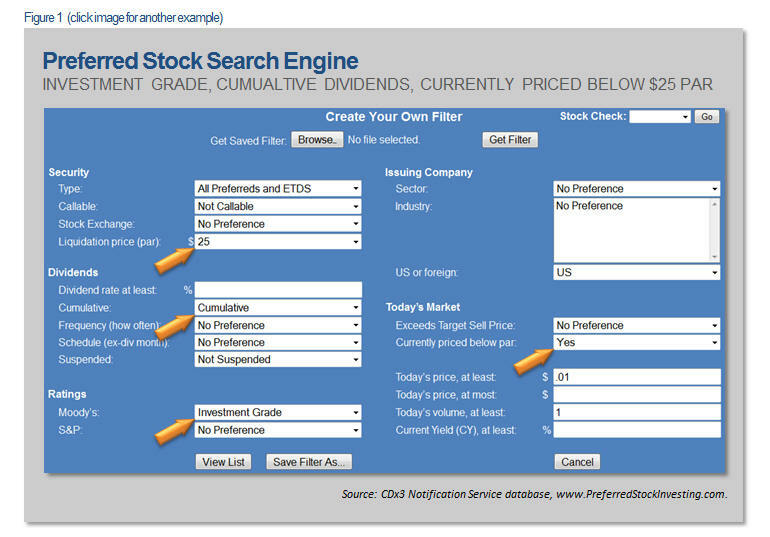 Preferred stock investors who are interested in cashing in the those capital gains can sell their shares for retail, then use the proceeds to buy shares of a new, similar preferred stock while it is being introduced on the wholesale OTC exchange—sell for retail above par; buy back in for wholesale below par. The OTC exchange provided a very powerful tool for savvy preferred stock investors throughout 2014 and is likely to continue doing so for many months to come. Preferred Stock Investing is one of the highest reader-rated books in the United States with 79 reviews posted at Amazon.